River Voice Community Choir is taking on a new challenge for its Christmas Concert this year. The performance is a big step change for the choir in that, apart from the congregational hymns, every piece will be performed a cappella – there will be no musical accompaniment. Many choirs shrink from singing without accompaniment as it can leave singers feeling very vulnerable and subject to pitching problems. Additional funding received this term from the Red Nose Foundation enabled the choir to have extra rehearsal sessions, which supported members in the development of stronger aural and vocal skills across the group. Musical Director, Tania Holland, says: “The idea for a choir that would cater for people with and without visual impairment emerged following a large scale community opera project called Element Beyond Gravity. “This was a new work devised specifically in response to Chatham Historic Dockyard and which brought together singers from across North Kent including a number of people with low or no vision. 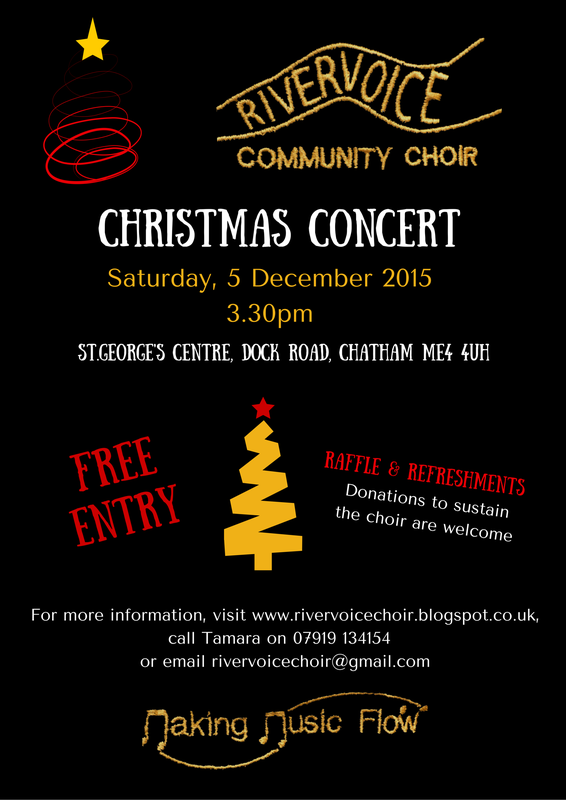 The concert will take place on Saturday, December 5 at 3.30pm in the St.George’s Centre, Dock Road, Chatham. Entry is free, although donations to help sustain the choir would be welcome – there will also be a raffle and refreshments. For more information, please contact either Claire on 07890 705698 / email cjfrewin@gmail.com or Tamara on 07919 134154 / email t.s.gummer2@hotmail.co.uk. This entry was posted on 30/11/2015 by Jaye in Creative and Art Events, Creative and Art News and tagged Christmas, concert, music, rivervoice community choir, singing.